The reason we have to attempt to reason or prove the existence of God to our fellow humans, is because if we do not, it may perhaps lead to the final act of the Sixth Extinction of our planet? Right now, on our planet, based on the growing numbers of non-believers over faith believers which in part are a result of secular teaching our children to choose science over religion as truth, a lot of “harmful gasses” are being emitted from the mouths of humans, in my opinion. King Solomon’s proverb 22:3 is being followed by Tom’s “style” to help fools become wise, in my opinion. Frankly, your “style,” while different from Tom’s, appears to me to be doing the same thing, especially when you debate with some fool “atheists’ intriguers “comments on your blog, in my opinion. Problem is even if it is self-evident when a wheel is screeching at 200 decibels, some people will never hear or even listen, in my opinion. But ‘must’ we prove the existence of God? Some must, others, eh, not so much. One thing I do know, and glad you mentioned it, is, the ‘self evident’ thing. Some things are just so darn obvious. Romans agrees. Take the above mentioned ‘theory’ of evolution. I suppose a man can ‘prove’ just about anything……….as long as he controls the math, and the interpretation of his lousy addition. Key word: theory. Just that, some theories better than others, others worse than most, but still, assumptions based on a world view. That said, there is no ‘theory’ of God. The scriptures are not a book of ‘theory.’ God’s word stands alone, apart, from EVERY book on earth, and as you know, there are many knock offs trying to boast of equal opportunities, fortunately, there are no competitors, as God Himself has no valid competition. God’s word is reliable enough, and is plenty of proof that He is trustworthy, truthful, and that from ‘the beginning,’ He has far more credulity than the very best of sages or liars. We have sunk so low as a society that the discussion of whether or not God exists is truly distressing. The voice of nature, arithmetic, the heart, conscience, and of course scripture, all agree that indeed is not only God self evident, but that He is not far from us. The morning songbirds even indict our stubbornness. If only the infidel would stop for a moment and consider: Who made the ranges of Everest, the expanses of the oceans, the redwoods, the stripes of the tiger, the humps of the camel, the wool of the sheep, the leather and milk, and beef of the cow, the ingenuity of the spiders web, the honeycomb of the bee which is the only insect which provides food, for man; life in all its splendor, death even, if all men would just be HONEST…………then your self evident thing would be warmly received, and man MUST automatically repent for such degradation aimed at He who gave him life. The basic reason people reject God is that they fear Him. God is Holy. Holy is scary. Holy is such an impossible standard. Yet Jesus promise to make us perfect. Take a lot of love and trust to believe that. What makes us try is the guilt we feel for our sins. That is why the shameless are the most hopeless and angry. I checked the source and have decided I am not qualified to comment based on scientific understanding of this issue. Instead, I will only post my experiences on this issue and comment on an ancient wisdom perspective. In my opinion, if we have to wear a pollution mask walking down the street, we are either fools or have no other economic means to move away from the area. If we do not do something to moderate to reduce the cause or circumstances of living in those conditions, we are foolish. At the same time, pragmatic wisdom is needed to discern what is now taking place on our planet and if possible, we need to be responsible to work to make wise choices happen for the interests of our posterity. LOL! I actually can’t even prove I exist,Tom! A bit humorous for sure, but science still struggles with trying to prove sentience and consciousness. It’s a really hard thing to quantify. And of course, we have the famous,”I think therefore I am.” But would any of us have even thought to think “I am,” without the Great I Am who first set us all in motion? Then there is the theory of the God gene. Science cannot really explain why, but nearly all humans, including primitive tribes, look up at some point and conclude there is something supernatural going on, a god or gods, if you will. I often see this even among atheists and secularists, they cannot help but begin speak of things like, “The Universe” or “Karma” or “Stardust,” or whatever name they are trying to give this Sentient Being that just makes His presence known to us. You don’t exist? I think it is axiomatic that you exist because I exist, and I can read what you write. It’s more like… I thought, therefore I was. Scary thought that. Every time we think we exist, we are always past tense. I suppose that means that those who live in the present don’t know they exist and that those who live for the future don’t care if they exist. ..well, we certainly have no say if we refuse to exist. That probably explains the people who act as if reality depends upon them. You have a wonderful way of putting things simply that I just spent a ton of cyber ink trying to explain in my comments on a previous post. I agree with most of your post and I especially like what you said about proving God and the importance of acting “as if” some things are true because doing so makes experienced reality coherent to us when we do so. Perhaps it was in the interest of simplicity that you explained how postulates (or axioms) are similar to a theory (or hypothesis), but you did not really explain how scientific postulates and scientific theories are also starkly different. The differences are important, don’t you think? For example, Darwin’s Theory of Evolution, Einstein’s Theory of Relativity and the Theory that Manmade CO2 Production is causing Climate Warming are all scientific “theories”, not scientific postulates or axioms. Theories depend upon the acceptance of certain scientific axioms (such as those undergirding mathematics) and the general acceptance of certain rules and procedures (such as the scientific method and a base ten number system), but they are still just theories subject to confirmation or falsification, not axioms. On the other hand, theories themselves appear to become almost axiomatic the more that they survive either logical or empirical contradiction. If we find one modern day horse that dates in the fossil record to the time of the dinosaurs, then it would pretty much falsify our current understanding of how life evolves. The fact that everything that we learn empirically or through other discoveries like DNA shows consistency with evolutionary development of species reinforces the Theory of Evolution to the point where no serious person in the world doubts the basic concept that all life on Earth evolved from some earlier life form. Furthermore, theories are often modified by other theories without completely falsifying them (such as how Einstein’s Theory of Relativity modified Newton’s so-called “Laws” of Physics). Darwin’s Theory of Evolution can and actually is being modified in this way constantly without the basic concept of evolving life being falsified. For example, we could find out that random gene mutation is not the “only” vehicle for evolution, and this may modify the how evolution happens without completely throwing out the idea that life evolves over eons. Another thing that perhaps should be emphasized is the difference between a thought that we all objectively accept as true, a thought one person subjectively thinks is true and ideas that many people intersubjectively believe to be true. When a group of people are in a room together they objectively accept each other’s reality. When a child truly believes that her imaginary friend is in the room with them, that is a subjective truth only held by her. However, when everyone in the room agrees that they belong to a corporation, then that is an intersubjective truth (a legal fiction) that everyone shares within that room. The truth of a corporation’s existence is the truth we all agree to give to its otherwise intangible existence. Why do we give reality to a legal fiction like a corporation? Because doing so allows millions of people on a worldwide scale who may not have ever met each other and who may not even speak the same language or have the same culture to productively cooperate with one another one scales that would have been unimaginable to our hunter gatherer ancestors. As you imply in your post, we believe in an intersubjective, often abstract and intangible concepts, that have no objective reality to us because acting “as if” the intersubjective concept is real simply “works”. The one intersubjective truth that unites the entire world right now allowing astronomic levels of cooperation is not a religion and it is not a language. It is numbers. No matter where you are in the world we have all adopted a common script for numbers in the form of Arabic numerals in base ten. Without a common number system of symbology (or script) and a way to record numbers, even after the agricultural revolution, we would have remained at most very small city states. Every single empire that began to sprout up separately all around the world had some form of number system and a way to record numbers that they used to organize large scale economic distribution of goods and services and to collect taxes. Globalization itself could not happen unless we all agreed to hold the same intersubjective abstraction in a common script for numbers and the base ten system. The whole course of human history therefore has been driven more than anything else by the adoption of common workable intersubjective abstract realities that allow absolute strangers to cooperate on larger and larger scales. (Just think about how “money, which is mostly now just numbers stored in large computer servers, and it is enough to blow your mind about the power of accepting large scale intersubjective myths). Why is this fact about intersubjective reality important to the issue at hand? Well, look at the first part of the Declaration about all men being equal that you referred to. Is equality an objective reality? No. And it was even less so at the time that they wrote the Declaration. We are all obviously very different even now with different talents, education, moral upbringing and opportunities. The intersubjective myth before the Declaration’s equality statement was that God gave the ruler his authority to rule everyone, and that statement in itself reinforced and self perpetuated its own inequality thereby reinforcing the myth through its own feedback loop. People were not at all equal and believing that the inequality was mandated by God kept everyone in their unequal places. Unless we could dispose of that intersubjective myth and accept a new one, then democratic government could not even get off the ground. Democracies work in so far as we accept the intersubjective myth that all of us are equal “as if” it were true even though know that there are contradictions. We can even accept two or more contradicting intersubjective abstractions at the same time, like the fact that we are all equal but that we need a certain amount of inequality for the intersubjective myth of capitalism to work. It is pretty amazing how many truths we can convince ourselves are self evident, especially when they literally work. Like you, I believe in God based on faith, and because the universe just doesn’t make sense without that presupposition. On the other hand, I read somewhere that Voltaire once wrote that he did not believe in God but that he hoped that his servant did, else the servant might murder Voltaire while he slept. Glad you enjoyed your post. After I listened to the R. C. Sproul broadcast and read your comment, it seemed like a good idea. Why did I not get into the subject of scientific theories? Well, I more or less did. I spoke of the scientific method. Advocates of the Theory of Evolution and Global Warming assume the truth of these theories. Since neither can be proven using the scientific method, they point to lots of evidence. Because these theories are popular with the authorities, few mention the advocates are guilty of a logical fallacy, an appeal to self-evident truth. We can either assume or find it self-evident that God exists, and acting as if that is a fact, that God exists, will provide a suitable axiom for life. Assuming the truth of the Theory of Evolution and Global Warming may or may not work. Frankly, unless you are in a profession that demands conformity with the Theory of Evolution, you can get by quite well without believing it. If our society start believing in Global Warming, however, I expect we will become bankrupt. If you check into some of the references I gave, you will also find that axioms have changed over time. Even our assumptions have to be updated. The later part of your comment seems a bit confused to me. The rules by which we operate just help us to work together. We use numbers to model financial transactions, for example. The model — numbers — does not create reality. It just helps us to understand an aspect of the real world. If the model does not work, we discard it. If our understanding of how we apply the model is wrong, we fix that. In what sense are all men created equal? Each of us is made in the image of God. Therefore, because we are all the children of our Creator, everyone deserves the equal protection of the Law. The fact we have different gifts does not change that fact. Observe what is the greatest gift, the capacity to love, 1 Cor 13. I don’t really understand why you don’t think that the Theory of Evolution and Man Made Climate Change are not scientific theories that can either be contradicted or further confirmed by using the scientific method. They are true or they are not. Like I said, if you find one modern day animal in the fossil record where he does not belong, then the theory that all species evolved from previous species is falsified by scientific empirical evidence. On the other hand, the fact that there is absolutely no record of a modern day animal existing during the age of the dinosaurs shows that some sort of evolution must have taken place. We also know from observation of viruses that genes mutate randomly and that random mutations can allow beneficial mutations to change the virus so that, for example, it can spread its DNA more widely and effectively. Remember, in the Darwin’s Theory of Evolution “beneficial” does not always mean something good for the species in any altruistic or cost/benefit economic sense. Beneficial in Darwin’s sense means a mutation better affords the mutated subject to spread more of his or her DNA onto the next generation. In Darwin’s economy of species development, you can even have ridiculous extravagancies like a male Elk’s antlers or the extreme feather colors, dances, noises and the stage like bower of the bower birds. An elk’s antlers have evolved to such extravagance that they are not otherwise worth the energy it takes to grow them. They are not particularly efficient for fighting enemies and they are so large and heavy these antlers are more likely to get the elk tangled up in the forest and worn out more quickly when he is running from a pack of wolves. Fighting off other males and impressing females so the elk with the biggest antlers can get his DNA on to the next generation makes Darwins theory the best explanation the otherwise wasteful extravagances of creatures like elks and bower birds. Accepting a theory that continuously survives contradiction and is instead constantly confirmed adds to the body of knowledge, the truth, about our world and why it operates in the way that it does. This is important knowledge whether you think that accepting the theory is useful in the moment or not. Even falsifying a theory adds to our understanding of how the world works. As for manmade climate change, knowing the truth one way or another could have enormous repercussions. If the theory is false, and we prove it false by empirical evidence or mathematical modeling, then we won’t spend ourselves into poverty by pursuing a false theory. Its not like there are not enormous financial incentives by the most profitable companies in the world to prove the theory is wrong. On the other hand, if the theory is true, then the repercussions could be existential to millions of our progeny, if not our species as a whole. Also, their could be benefits to pretending that the theory is true even if it turns out to be false. Even if CO2 is not an issue, fossil fuels are not exactly endless or without other environment costs (coal in particular), not to mention maybe we don’t have to expend American lives and treasure defending brutal medieval regimes in the Middle East. I think that we are up to about seven trillion dollars spent on our endless wars in Afghanistan and the Middle East since 2001. As for the last part of your response, I think that you underestimate the unifying power of intersubjective models. Even a false intersubjective model can “work” amazingly to unify an extremely large group. There have been studies on how large a group can be and its members work together cooperatively based only on the interpersonal relationships between all members of the group. If I remember correctly, after a group has more than a little over a thousand members, unity based only upon relationship breaks down because its members just can’t know enough useful interpersonal information about every member of the group. On the other hand, if we share a common mythology, then the group can get much bigger. I would not have had to know every other soldier in the Roman Army to cooperate fully if we both believe that our emperor is a god or that he has the divine right to rule over us and all the world and that it is our divine destiny to subjugate all the other inferior peoples around us. Rules of authority can be modeled and mapped out. I may not know the Roman soldier in the regiment on the other side of the battle field, but we will work together as one cohesive force to defend our intersubjective fictions to the death. Look at the intersubjective myth of communism. It persisted and even thrived in the Soviet Union for more than half a century. It managed to create an empire that grew into an existential threat to us and the rest of the free world. It essentially did not collapse until the Russians themselves saw that there own leaders did not live according to the intersubjective fiction of a workers’ paradise. When most Russians quit believing in the myth of communism it collapse under that bankruptcy of confidence. As for all men being created equal, I agree with your view of it now and it’s basis in Christian postulates. However, the intersubjective model that the founders sought to create is not the same model you are giving now. They didn’t believe that all humans were created equal. They believed that all white males were equal in a very few ways that are more rhetorical than realistic (deserving of life, liberty and happiness, however that might be defined). Actually, only white male property owners were allowed to lead and vote. Our myth, along with our government had to evolve over two centuries, including a bloody civil war, Amendments to the Constitution and a good many of court decisions and legislations to get to where it is now. However, even when the intersubjective model only included white males and it was obviously full of contradiction, it was unifying enough to join the nation in rebellion to throw the previous myth of the divine right of Kings. Kind of busy, but here is a quick response. There is insufficent cause to accept either Darwin’s Theory of Evolution or manmade Global Warming as established facts. This is about politics, not science. Intersubjective model? The expression reminds me of the exercise of take a word from three different columns and stringing them together into an expression that sounds like it means something. There are more specific ways of describe flawed thinking. We cannot comprehend the world. We can only model it. The models we make don’t cover the whole world at once. We can only model pieces of it at a time. A model is just an abstract representation. If we don’t understand our limitations, we can get very confused. Some of your illustrations illustrate just how stubbornly confused we can be. I’m still mulling over Murphy’s Law. Murphy’s Law is actually spot on in this context. Just when we think we have everything figured out, and we are dependent upon being right we discover we an unintended consequence. You mean like the 2016 election? Good example! Democrats had this theory about how they couldn’t lose. I agree that it is unscientific to EVER take any scientific theories as “established facts”. Even Newton’s Laws of Physics were not really “laws” but only theories subject to contradiction (falsification), confirmation and modification, depending upon how they survive mathematical and empirical experimentation. As I said earlier, according to Karl Popper, it is the quality of a theory that it is subject to such falsification at all that actually makes a theory “scientific”. If the theory continuously survives rigorous scientific attempts to either contradict or confirm it then the scientific method means that scientists will naturally gain confidence that the theory is true (closer to “established fact”) but when scientist calls any theory, even theories no serious person questions anymore, a “law” then they are committing a grievous fallacy within the scientific epistemology – in short, they are not being scientific anymore. You make a good point therefore when you say that any scientist who does not recognize his own confirmation bias is not practicing science, whether that confirmation bias is out of politics or religion or because that scientist’s job and professional reputation depends upon a given theory being true. However, even though an advocate of a given theory may have an unscientific confirmation bias that causes him to accept what is only scientific theory as an established fact, that does not make the theory itself either false or unscientific. On the other hand, have you considered that most of the arguments against theories like Man Made Climate Change and Darwinian Evolution contain their own unscientific confirmation biases? For example, Manmade Climate Change, as a scientific theory is either true or it is not, and it is not as if the truth or falsity of this theory is inconsequential. Indeed, as I said before, it could be existential for millions of our progeny, and in the short term, preventing it or ignoring it will have dramatic economic consequences. For a pure scientist, politics should have nothing to do with their opinion on the truth or falsity of the theory. For the political ideologue, however, the truth of Manmade Climate Change is enormous because solving the problem will undoubtedly take a governmental role on not just a national, but an international scale. If a scientist is fairly libertarian or his livelihood depends upon the success of fossil fuels, then he really has to watch that his confirmation bias does not unscientifically make him simply assume the theory is false, despite growing scientific evidence showing otherwise. Political and economic confirmation bias is also possible in the opposite direction. Although it is very scientific to be skeptical, I think that we each have to ask ourselves whether our own skepticism has little to do with science at all. “We cannot comprehend the world. We can only model it. The models we make don’t cover the whole world at once. We can only model pieces of it at a time. A model is just an abstract representation. If we don’t understand our limitations, we can get very confused. However, I am a trained historian. So, I know historical things. I do know that Darwin in his Evolutionary theory was based on our lack of fossil records. And because of the lack of fossil records, he hung his theory that we would discover transitional fossils at a later date. Today, we currently have a great many fossils and for every evolutionary biologist claims one is a transitional fossil another evolutionary biologist refutes him. I can’t make head or tails of it. I’m just trying to be objective. I’ve been taught all my life to trust evolutionary theory, but why not ask questions? I find that those who ask questions get called denier or what not, but I figure someone should be willing to explain it to me. Are we still waiting? 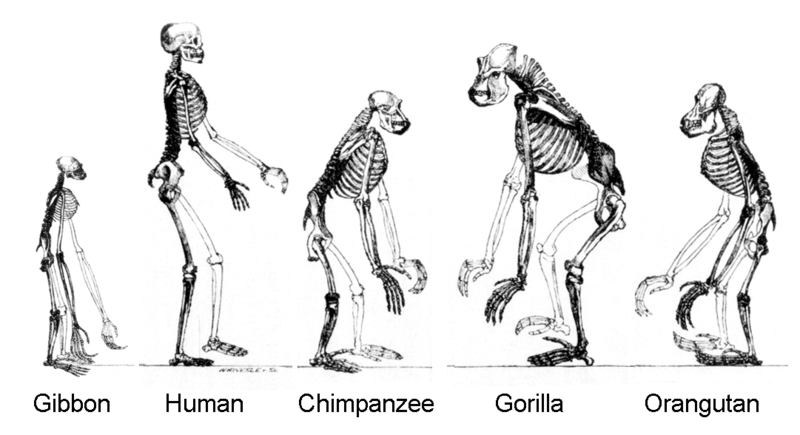 Why am I told that some believe Australopithecus is transitional and others do not? Why does Australopithecus artist renditions have “whites” in their eyes when that is a human trait of communication? Why do they have human feet when those feet fossils haven’t been discovered. Do (are they allowed) people ask these questions? I’m not really sure what the question is but I am pretty sure that you are allowed to ask it. I know a few things about science because of previous professions required me to have at least a rudimentary working knowledge in various areas of science such as aerodynamics, engineering, oceanography, hydro-acoustics, meteorology and nuclear science, and also because I love to read about science. That said, I am certainly no expert on the evolution of species. However, if your question is whether life evolved over millions of years, like I said, if they find one modern day animal in the fossil record during let’s say the Jurassic period, then any theory of evolution is refuted. The fact that we don’t have a perfect fossil record chain from one species to another simply says something about how extraordinary it is for any fossil at all to exist after millions of years. It’s like trying to figure out the exact plot to Casa Blanca when all you have is a few dozen random frames of the film to look at. You might be able to figure out that Bogart’s morality evolved throughout the movie, but it would be hard to decipher every step of how he got there. Luckily, they keep adding new frames all the time. In fact, things seem to be changing so fast that it is hard to keep up with it. On the other hand, if you are wondering if the species, Homo sapien, is somehow different from all the other life on the planet, and that we did not evolve over time under the same laws of nature of every other creature because God placed us here fully formed, then I don’t believe that that is a theory that is subject to scientific falsification or confirmation through the scientific method. That would be something supernatural that God did, like a miracle. I personally tend to believe that a miracle is just something that is completely natural to God, but that we may or may not ever fathom it because we are finite creatures in this life at least. If some human from even a few hundred years ago saw a modern jet airliner fly overhead, he’d think it was a miracle too. I don’t have any problem with saying that science doesn’t know and may never know everything. I just think that truth is truth, whether it is spiritual or scientifically discovered, and I don’t believe that God gives us conflicting truths between science and revelation. If the two truths contradict, we either don’t fully understand one or the other, but that is just my opinion. We do know from the fossil record, however, that we were not the only human species on the planet a little less than a hundred thousand years ago. There were also at least a few others from what I have read and they include Homo erectus, Homo neanderthal, Homo denisova, Homo naledi and Homo florensus, the so-called “habits” who may have lived on the Island of Flores as little as 18,000 years. For mysterious reasons that are only theories, none of these other humans survived exposure to our species. It is my understanding from a book that I read recently that gene mapping of these species in the last few years shows that there was some interbreeding between some of these species and modern humans. If God put us here straight from the Garden, then he also put us originally with several other species that in many ways looked and acted just like us, but in other crucial ways were completely different. It appears that one of the important things we had that they did not have wasn’t even a larger brain, but instead a much larger imagination, an imagination that allowed us to adapt and cooperate in ways that made us the most successful species on the planet practically overnight. God works in mysterious and extravagant ways, and I personally believe evolution is probably one of those ways. “Does it make sense to assume God exist? Should I test this axiom by living as if God exists?” Those are excellent questions Tom, both packed with so much meaning. To go about your life and not care one way or the other who or what is responsible for giving it to you and what that means in the larger scheme of things is I think to live rather shallowly. Such as Plato said, an unexamined life is not worth living. Was Solomon looking for a good woman? His personal experience with women lacked something, and that was his own doing. Still, other parts of the Bible indicate Solomon did respect women. I doubt King Solomon had any particular man in mind, but I don’t know. I think the point is that all of us are sinners. Even a good man is a sinner. If I am correct, it would agree with your final comment, in your post. Or in other words,we all find “other schemes” that are or lead to one or all of the the seven deadly sins sometime in our lives, both men and women,. However, that doesn’t mean it is an impossible task. Rather a noble challenge, perhaps an even greater challenge for women than men? There are numerous interpretations of this verse as to who the one man was. Who would you surmise that man to be according to your interpretation? Interesting and timely post related to my recent experiences visiting two world-class museums this year. I became interested in searching for scientific information of the six extinctions which have occurred over time and are now occurring on our planet related to climate change and hominids evolution. What I believe might support your post is the scientific facts on DNA. That is in spite of all the evolutionary study and theories, there has never been any 100 percent DNA match evidence of homos and humans. As for the Ice Age and the polar vortex, I believe the best explanation in a WordPress series, out of all the explanation. My post will not prove or disprove anything scientific. Rather it will be based on the same premise of your post for readers to decide as you present in your post with Bible verses. As for my opinion, anyone who believes God was not involved in the creation of both man and planets is a fool. I have had a look at jantzen chapter 6. The author starts out with making the case, that CO2 is a trace gas and hence can not matter, omitting that CO2 is absorbing in the infrared, while oxygen, nitrogen and nobel gases do not. To make the point clear, here is an analog example in the visible range, the second beaker on the right, labeled 1.8 mg, holds potassium permanganate at a concentration of 205 ppm. According to jantzen’s reasoning, the liquid appears uncolored. New research suggests that the CO2 level of the atmosphere was a lot higher during the Medieval Warm Period than today. 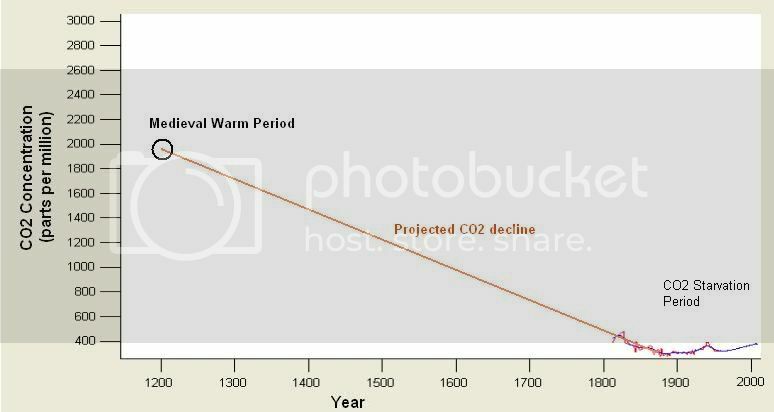 Based on the best science available, CO2 levels may have been over 2000ppm in 1200AD, or during the Medieval Warm or about 800 years ago. I presume DenialDepot to be a satirical site. Thanks for your comment. I will have a chemical physics friend check out the entire six chapters for his opinion. May I ask if you have any similar degrees. Frankly, I do not, I only chose this report as a comparison to the previous sources I read. This one has a much more extensive range of time than others.for comparisons. Have you read all the chapters? I will have a chemical physics friend check out the entire six chapters for his opinion. I consider requiring your friend to read that blogpost series in its entirety a cruel and unusual punishment. 😉 Please do allow your friend to stop, should he/she come to the conclusion that the excercise is a waste of time. I hold a doctorate in physics, but in a field completely unrelated to climate science. Should you have specific points jantzen raises that you want me to comment on, I’ll have a look. https://skepticalscience.com/ is misnamed. It has swallowed the manmade global warming myth hook, line, and sinker. Propaganda comes in many forms, and marmoewp is a propagandist. He pushes his side of the issue. Nothing wrong with that. He does not pretend to be doing anything else, but he is quite careful, thorough, and knowledgeable on this subject. That can be intimidating, and it is the sort of intimidation that made global warming the so-called scientific consensus. So check other sources. I told scatterwisdom up front, what view on climate change that site is taking. You call manmade global warming a myth based on what evidence, exactly? I strongly resent the term propagandist, as it implies that I am willing to lie and mislead for some hidden agenda of mine. I have neither lied nor misled in any of our discussions in the past and have no intention of doing so in the present of future. Advocate, yes. Propagandist, no. That can be intimidating, and it is the sort of intimidation that made global warming the so-called scientific consensus. Competency has the tendency to be intimidating to someone unwilling to look into a subject for himself. The consensus is simply a statement of fact: Thousands of people have studied and are studying subjects related to climate, and to the best of their knowledge they think, that mankind is by its actions changing the climate on Earth to the detriment of mankind. When about 97% of people working in a field share the same view, that is called a consensus. So you agree (here => https://citizentom.com/2019/02/05/must-we-prove-the-existence-of-god/comment-page-1/#comment-85984) the sun affects the earth’s temperature and carbon dioxide levels. However, no one has established that changes in carbon dioxide levels significantly drive the earth’s temperature. Interesting observational data is not proof. So you told Scatterwisdom about the bias of that site. Do I think manmade Global Warming is a myth? The theory itself? No. The myth is the assertion that manmade Global Warming is a proven fact. I cannot prove manmade Global Warming isn’t true, but the burden of proof is not mine. There may in fact be some truth manmade Global Warming. I don’t know. As I have told you before, I have no objection to the idea of dropping other taxes and making up the difference with taxes on the burning of fossil fuels. What I don’t like is the way the propagandists are using the issue as an excuse for big government. Since Socialist governments tend to be highly destructive of the environment, I have little confidence in the opinion of the Socialists trying to shove manmade Global Warming as a “fact”, the grand consensus of the experts, down our throats. Without solid proof or anything close to it, the demand we accept manmade Global Warming axiomatically as an established fact does not make scientific sense. All it indicates is an irrational unwillingness to compromise for the sake of a political cause. You strongly resent the term propagandist. Well, I choose my words as carefully as I can. I don’t think you are a liar, but you are not a mere advocate. There is a difference between being competent and displaying competence for the sake of intimidation, and we both know the difference. Even if we are an expert in a field, we don’t go to our boss and try to intimidate him into agreeing with our point-of-view. What our boss wants to know is the options he has available and the pros and cons of each option. If we don’t respect his judgement and his ability to comprehend the technical issues, we may as well get another job (or talk to someone else). The fact I respond to your comments indicates I respect your opinion, but I don’t agree manmade Global Warming is an established fact. Why is the percentage of Liberal Democrat university professors so high in America? Because it is a wise choice? Nope! But it is the consensus choice for that group. Yet in the long run Socialism does not work. The consequences of manmade climate change are intimidating and I can understand the urge, to simply close ones eyes and pretend it is not happening. Even more so, when the proposed solutions include more taxes, more regulations, more government, more international cooperation and each of these is anathema to your view of the world and how it ought to be run. Unlike Tom, I am not going to tell you, what to not have a look at, and unlike him I am not trying to shoot the messenger. I do urge you, however, to look at mainstream sites like skepticalscience, too. It is a good resource, as it addresses most talking points of people rejecting the idea of manmade climate change. Take an argument against that idea that you find compelling, try to find what mainstream science has to say on this, compare and contrast. Lather, rinse, repeat a few times. Weigh who is misdirecting or lying more often. Your friend may be helpful in that endeavour. As demonstrated above, do not take simple statements like “it has been cooling since 1998” for granted. My above offer of limited help stands. If I am to advise a friend or my boss on an issue, and one option is based in solid facts, reason and understanding and the other option is based on lies, misrepresentation and incompetence, I would be remiss in my obligations to my friend or my boss not to point this out in no uncertain terms. I do not know about you, but I have a tendency to go after deliberate disinformation with a sledgehammer and I do not sugarcoat it. If you consider that intimidation, so be it. However, no one has established that changes in carbon dioxide levels significantly drive the earth’s temperature. Interesting observational data is not proof. Natural science does not work on the basis of proof, and you would know that if you ever were seriously interested in natural sciences. You observe, you make a model. If the model is decent, it is able to replicate and shed insight on past observation. If it is any good, you can make predictions based on it and verify them from further observations. If it stands a lot of these tests, and is useful in explaining observations, it is considered a theory. Models in natural sciences can be invalidated, but they can not be proved. The rise in temperature driven by an increase in CO2 has been demonstrated and quantified both in models and observations of the climate past, e.g. during the ice ages. Climate science is at that stage, it is being considered a theory, which has stood the test of time. It was predicted and observed, that polar regions warm faster than the rest of the world. It was predicted and observed, that lower atmosphere is warming, while the upper atmosphere is warming, a fingerprint of warming induced by an increase of greenhouse gases. Just to name a few vindications. The Theory of Climate Change has proven its utility in explaining past observations and the same mechanisms governing our atmosphere have been successfully applied to other planetary atmospheres. You claim you are not competent to understand the background of the science and you have repeatedly refused to even take a closer look when help is offered, yet you feel competent to pass a verdict that we do not know enough to warrant action. What feeds this confidence of yours? I have not said I don’t have the competence to delve into Global Warming. I don’t want to make this blog all about Global Warming. Have I accepted your “help”? Who is stopping you from commenting? What about “proof”? What is scientific proof of a hypothesis? An hypothesis is a model. Proof is an experiment that shows the model works. Advocates for Global Warming can point to anecdotal evidence, but that hardly constitutes proof. I have said that I am agreeable to dropping other taxes in favor of taxing the burning of fossil fuels. What is wrong with that?Why won’t you be happy until I profess to being a true believer? I don’t know, but I don’t think you are being objective. I use to get bunches of chain emails forwarded to me that sought to fool people with lies. The lies were designed to make people look foolish by telling folks what they wanted to hear. Unsurprisingly, I discovered that older folks, even those who are well educated and quite intelligent, are quite susceptible to these frauds. Many still have not gotten use to the fact that anyone can publish anything to the whole world on the Internet, and it hardly costs anything. Undoubtedly, the people who design those emails and other such frauds are very happy when their little tricks work. Then they get to point to those they lied to and cast aspersions on their intelligence. Thank you for just offering a correction. As I observed in my post, instead of believing what the “authorities” tell us to believe, we now demand proof. That, unfortunately, does not stop some people from confusing the situation by devising excuses to launch various sorts of ad hominem attacks. It is better to just ferret out the fraud and clean up the data. Are there people who will stubbornly believe things that are demonstrably untrue? Yes. That is why we want to demand proof instead of believing what the “authorities” tell us to believe. So does jantzenchronicles.com contain fraudulent data. I have not have time to investigate. If Scatterwisdom wants to do that, it is up to him. So what about your points. Supposedly, cabon dioxide level went down during the ice ages. We apparently can measure the amount of carbon dioxide in the atmosphere from ice core samples taken from glaciers. So there is a bit of puzzlement here. Does warming earth increase the amount of carbon dioxide in the atmosphere, or does an increase in the amount of carbon dioxide cause the temperature of the earth to increase. There is this factor we call the sun? Would it have anything to do with global warming? Does warming earth increase the amount of carbon dioxide in the atmosphere, or does an increase in the amount of carbon dioxide cause the temperature of the earth to increase. Yes. 😉 In short, cooling and warming trends caused by external forcings (like changes in the Earth orbit) can be amplified by CO2, as an initial ocean cooling/warming will decrease/increase atmospheric CO2 levels, which will cause more cooling/warming, respectively. Injecting large amounts of CO2 from fossil fuels into the atmosphere, as we are doing right now, however, is enough to cause substantial warming. In general, yes. However, raising the atmospheric levels of CO2 by burning fossil fuels has been the dominant cause of warming and climate change over the past about 100 years or so and will continue to do so over the next centuries. I can’t understand why there’s a debate at all. Well.. yes I can because we are all human. I personally don’t care about any debate to try to “prove” evolution or the existence of (a) God. I accept the fact that man is also a spiritual creature placed in a reality for which he must survive in order to reproduce. I contend man can exist on those two levels. In this day and age it’s not necessary to side one over the other. But that will be an eternal debate for the existence of mankind to muddle through. Not certain what you mean. In this day and age it’s not necessary to side one over the other. What does it mean to side with one side over the other? Well, there’s no one compelling us to believe solely one way or the other under penalty of death or imprisonment, like the Middle Ages and earlier.. correct? We are not under some duress. So there’s freedom to believe one way or the other.. or both. I think that a substantial percentage of the population believes that government power is being used to pressure people to disbelieve in God. The public school system is getting ridiculously antiChristian. Tom, for as much as you lament about the evils of public education I can equally lament.. what’s wrong with teaching religion in the home? No fear of someone imposing their Biblical interpretation on your children… great for the “quality control” of what your children are exposed to as not being outside your preferred family beliefs… and you can include your own set of family morality. You already don’t approve of someone else teaching your children traditional curriculum, why would you dare allow a non-family member teach your kids religion? Why is it your business to tell other people how to teach their children? The public education system use to be a local government operation, and the people who ran it were under the direct control of the community where a school was located. Now it is a a big government mess heavily influenced by special interests. Why do you want to defend such an infringement on parental rights? Why do politicians need to tell us how to educate our children? Apples and oranges, buddy. Critique public ed all you want… why would you want “public anything” teaching your kid religion outside the home? Once we put politicians in charge of anything, mission creep is inevitable. The public schools instill beliefs and values in children. You familiar with the generation gap? What do you think causes it? Why do you think the beliefs of Americans have changed so quickly? When there is no reason government has to run our schools, what is the point of putting politicians in charge? It is good for freedom? Politicians are more trustworthy than parents?